Realtor.com® Rentals is the ideal one-stop app for anyone looking for a new apartment or house to rent with plenty of amazing search capabilities. 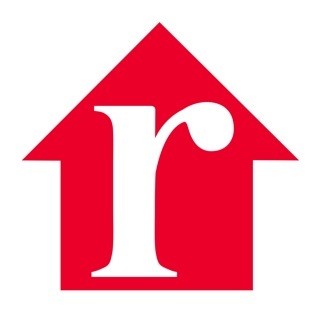 Try the dedicated rental app from realtor.com®, the trusted leader in online real estate. Search for new rental properties, draw a custom search area on the map and find the perfect place to rent with the realtor.com® rentals app. • Search through hundreds of thousands of rental apartments, houses, condos and even townhomes. 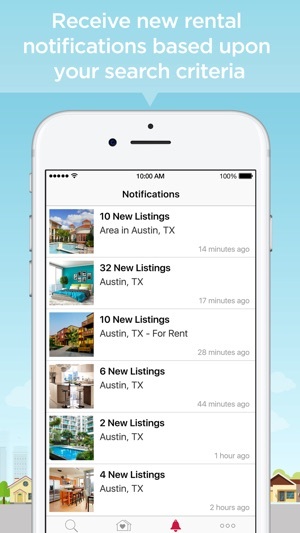 • Receive instant rental listings that are updated every 15 minutes with alerts and notifications. • Narrow search results with targeted features and receive push notifications when new property listings pop up, matching your search criteria. 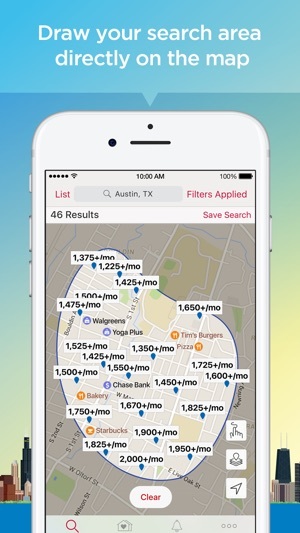 • Expand Search Area filter - find even more rentals near your city or neighborhood of interest. • 3D rental home tours (where offered by listing agent). • Sort rental listings by lowest price, recently added, photo count, and more! • Crime Map: view a heat map of crime rates in your area of interest. • Use the map to find houses to rent in your current area and use the Area Scout to view rental homes and apartments while you’re on the move. • Draw your own custom search area right on the map to find a property in the area you want. • Include photos of homes and apartments for other users to view, before making an offer. 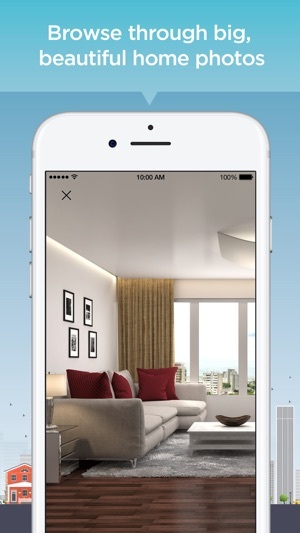 • Swipe through detailed photos of apartments and homes to rent for a fast and easy browsing experience. • See the details of each property including price, bed, baths, amenities and more. • Call or email property managers directly from the app. • Save rental listings that you’ve already contacted for easy access later. • Keep rental details at your fingertips by adding notes directly to property listings. Find the rental homes you want, narrow your search with enhanced features and make your experience easier with Realtor.com® Rentals. *For units within multi-unit communities, search may be limited to representative floor plans and/or photos, and availability to rent depends on the number of vacancies from time to time. 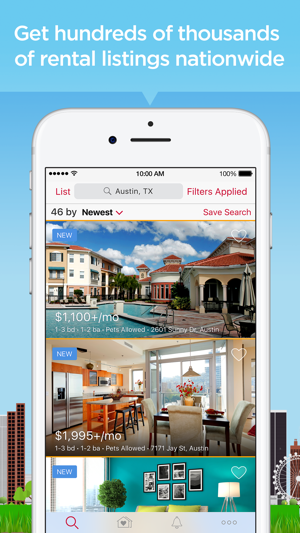 Find your next home rental with our easy to use search tools and in-app features! • This update includes performance improvements. It’s nice that we are getting more listings. I advise everyone to cross check the address with other sites. I have found about three fake listings, i.e. nonexistent address, an actual rental relisted by an impostor for less than the true price. My only suggestion is the inclusion of deposit and pet acceptance information. Also, the realty company handling the property should be disclosed, if applicable. Some local property management companies are shady, and discerning renters no longer want to do business with them. 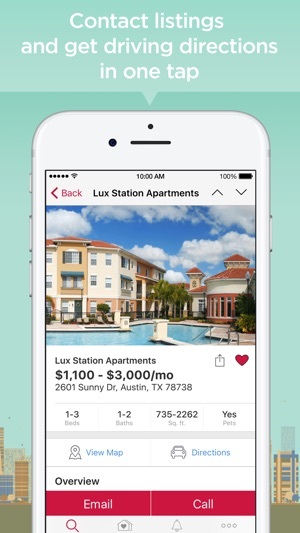 There’s no app that I’ve come across filled with so many apartments in different areas as yours. You cover all the information needed to be able to decide which place is where you could see yourself living. I really am enjoying this adventure of looking for the apartment that I hope to be renting. Very helpful app with trying to relocate a family. It’s like I can find all the apartments that I’ve spent hours searching for across several sites online all in one convenient and easy to navigate app. Thank you so much for this great experience and lower my stress level enormously!